Following the effective black-and-white cinematography of Winchester '73, I was disappointed to learn that its follow-up would utilize Technicolor. The DVD transfer does look gorgeous, but it removes some of the edge from a story that veers into surprisingly dark territory. Another difficulty is the rousing music, which feels out of place during some tense sequences. Nothing takes you out of a nerve-wracking moment better than the typical genre music. It's a strange mix between complex human emotions and a different kind of nostalgic western. The Technicolor also makes this story feel more dated while presenting some impressive scenery. 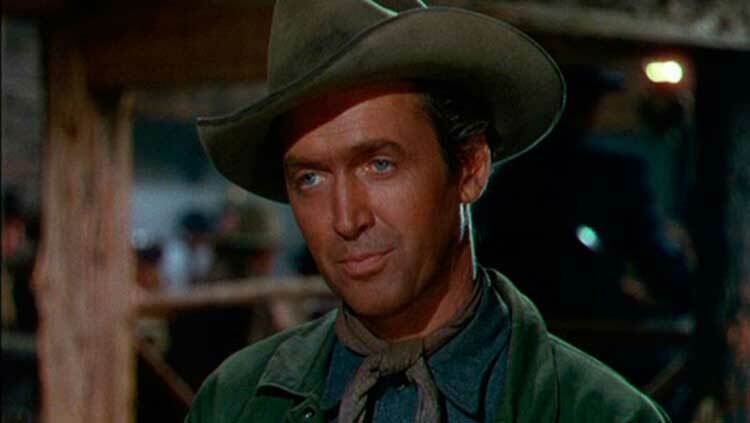 Stewart stars as Glyn McClyntock, a former outlaw leading a wagon train to the promised land in Oregon. The friendly citizens don't know about his violent past and seem judgmental about gunfighters. By chance, he saves Emerson Cole (Arthur Kennedy) from a hanging and they became quick friends. Both share similar histories but have much different views on a man's ability to change. After reaching Portland, a gold rush brings greedy prospectors to town and threatens much-needed suppliers for the settlers. Along with Cole and card shark Trey Wilson (Hudson), McClyntock makes daring moves to transport the essential goods. Facing enemies within and outside his group, he relentlessly leads the second wagon train over the mountains to reach his ultimate goal. 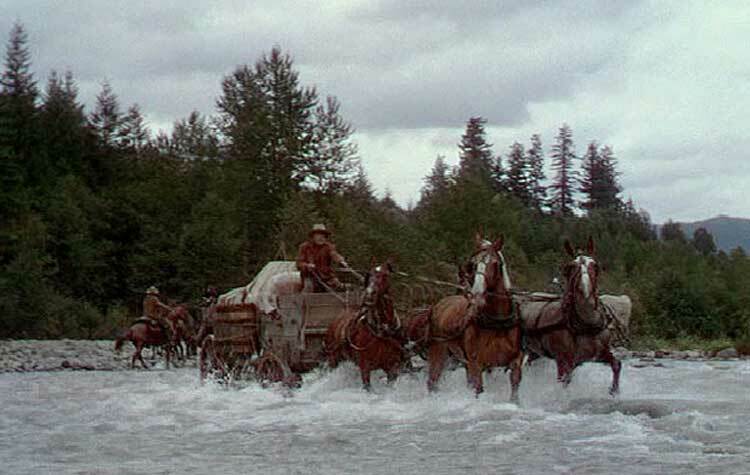 For a fairly conventional western, Bend of the River provides some haunting moments that demystify the typical hero. Stewart again plays a believable killer who’s tried to leave his old life behind. Similar to Clint Eastwood’s William Munny in Unforgiven, he convinces himself that a man can change, possibly through the love a good woman. The girl here is Laura Baile (Julia Adams), who’s connected to Cole but appears to share a bond with McClyntock. Her role seems designed more to support ideas than to provide much romance. Adams does serviceable work, but screenwriter Borden Chase cares mostly about the two male leads. Both guys also seem more interested in the other than Baile, as evidenced by the bonding of fighting off some Native Americans in the early going. Another intriguing theme is the civilization/wilderness conflict, embodied by the changes in Portland caused by the striking of gold. In its first appearance, the town feels like an idyllic Hollywood version of a frontier settlement just starting to become a city. When they return, it’s a western form of hell, with gambling, random shootouts, and crazed lunatics hoping to strike it rich. Those scenes are the most effective in the movie, particularly when a violent mob pursues the heroes looking for blood. It marks a major change from the natural haven enjoyed by the mountain settlers. The plot has many resemblances to Howard Hawks’ Red River, especially in the final act as double crosses occur to take over the wagon train. Stewart can’t match John Wayne’s classic intensity, but he delivers some chilling moments. Holding a knife over a villain with a manic stare, he showcases the violence buried inside the calm guy. Thankfully, this picture doesn’t let the characters off the hook like the awful ending of Hawks’ film. The story plays out like expected, with McClyntock stepping up to reveal his superior gun fighting skills. In similar fashion to Munny, he realizes there’s only one way this train can end. Bend of the River offers a minor step back from Winchester '73 overall, but it builds well on Anthony Mann’s key themes. Stewart is growing more comfortable in the western genre, and Hudson reveals again why he became a star. Hidden as a Native American chief in the previous film, he brings charm to a possibly one-note character. Kennedy’s Cole is also an interesting foil for Stewart, bonding with him while never really sharing his beliefs. Their final showdown is brutal and unsentimental, bringing a rough closure to a slick picture. The positive end is a bit too on the nose, but Stewart’s calm facial expressions sell even the overly sentimental message.